**We have a huge show posted today with Rewind-A-SmackDown. On this week’s show, Wai Ting and I review SmackDown Live, 205 Live, the Mixed Match Challenge and we also reviewed the WWE 24 special on WrestleMania from last year. In addition, we also go over Jeremy Borash’s exit from Impact and joining the WWE, Rockstar Spud debuts on 205 Live as Drake Maverick, and we take your feedback and questions on the show at https://www.postwrestling.com/2018/01/31/rasd-1-30-18-owens-zayn-dissension-new-205-live-gm-braun-alexa-jeremy-borash/. **Late tonight, we will have the launch of KEEP IT 2000 on POST Wrestling. Brian Mann and Nate Milton will be continuing their look back at Monday Nitro from the year 2000. On tonight’s show, they will be joined by Damian Abraham to review the June 5th, 2000 episode from Atlanta, which Brian attended live at the time. All of the information to subscribe to Keep It 2000’s exclusive feed is available at https://www.postwrestling.com/subscribe/. **Tuesday night’s episode of SmackDown Live, which went up against coverage of the State of the Union address, did not receive any post-Rumble bump. The show averaged 2,509,000 viewers on the USA Network. The average was down 71,000 viewers from the week prior and was SmackDown’s lowest number since December 12th. **Newsweek conducted an interview with Impact Wrestling executives Ed Nordholm, Don Callis, and Scott D’Amore with the first part running on Wednesday. The feature in today’s piece was confirming the exit of Jeremy Borash, Ethan Carter III (Michael Hutter), and Bobby Lashley. In the piece, Nordholm confirmed Borash was going to the WWE and they wished him well while also pointing to other members of their team that didn’t get the same attention as Borash but were talented and could now step up to fill the void. Hutter’s contract was not up yet with the company, but he sat down and discussed his future with the company and they agreed to work out a deal to provide him with a release and led to his signing with the WWE and appearance at Takeover this past Saturday. 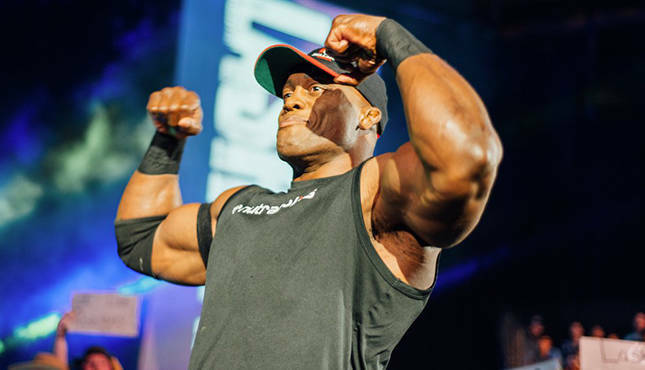 The final outgoing roster member was Lashley, whom Nordholm admitted they wanted to retain but Lashley has other plans and wasn’t sure if it would be pro wrestling or mixed martial arts. Nordholm stated that negotiations with Lashley have ended and he is free to pursue his next opportunity. **AXS TV will be airing the March 25th “Strong Style Evolved” show live that night from Long Beach, California. There is nothing confirmed yet for The Fight Network in Canada to air the show, which they did for the first night in Long Beach last July. Tickets for the event at the Walter Pyramid sold out immediately this past Monday with just over 4,700 tickets sold in under 20 minutes. No matches have been announced yet for the show. The show will also be streaming worldwide on New Japan World for those without AXS TV. The event will be uploaded on New Japan World after the AXS TV airing for those in the U.S. as well. **On Tuesday, I posted a list of the most viewed segments from the Royal Rumble on the WWE’s YouTube page. I posted this list of the four most viewed items and it spread like wildfire. The takeaway for me was the incredible amount that Rey Mysterio’s surprise return generated (at last check, more than 8 million views) and by any measure, it’s a tremendous number. A lot of people used this list to try and argue Ronda Rousey’s appearance being less significant and this would be an incorrect conclusion to make. In hindsight, I should have just have looked at Rey’s number on YouTube because it wasn’t an apples-to-apples comparison using Rousey, and by creating a list I inadvertently created a comparison. The Rousey segment was sent out by the WWE to lots of media outlets to embed on their own sites and was covered way more than Rey Mysterio’s return. We don’t have access to the numbers that ESPN and other media outlets generated for that clip (although ESPN posted a 1:00 version on their YouTube, which has 1 million views alone) and subsequent articles on her WWE debut, but it’s massive given the outlets that covered it. I would never argue that Ronda Rousey’s appearance was not the biggest news item coming out of Sunday. Sean Ross Sapp at Fightful has a very good breakdown of the reach her appearance had, including 2.7 million additional views for Rousey’s segment on the WWE’s Facebook pages (Rey’s return was not posted on Facebook and therefore would be concentrated to YouTube). One final point, is that Rey’s level of views on YouTube is still a phenomenal number by WWE standards but it’s a bad comparison with Rousey’s YouTube performance because it isn’t a fair one and you would need to be living under a rock to believe that Rousey was not the biggest story from Sunday. In short, I felt I provided this list on Tuesday without adequate context and I hope this provides the proper amount in which to look at those numbers. **The season finale of Total Divas airs tonight on E! at 9 pm Eastern. **The live viewership for Tuesday night’s edition of the Mixed Match Challenge saw another big drop. The match between Braun Strowman and Alexa Bliss vs. Sami Zayn and Becky Lynch peaked with 62,300 people watching on the streaming platform. The show has been major drops in live viewing each week with the show peaking at 136,000 for the first week, 91,000 in the second week and then the drop in the third week. It is important to emphasize this is only the live viewership and that the episode is available to watch throughout the week on Facebook, as well as on the WWE Network. **The former Rockstar Spud (James Curtin) made his WWE debut on his 35th birthday on Tuesday night as the new General Manager of 205 Live. Spud will be going by the name Drake Maverick in his WWE incarnation. Spud was signed by TNA Wrestling after winning the first season of “British Boot Camp” and became a regular member of the roster in 2013. Spud immediately stood out as a versatile performer, playing the role of Dixie Carter’s chief of staff and a second for Ethan Carter III. The dynamic between Spud and EC 3 became a highlight of the show and eventually built to Spud standing up for himself and feuding with Carter. As a speaker and actor, he brings a lot to the General Manager role and has the added benefit of being someone that can eventually do physical angles and a big match to culminate a storyline. **The two wrestlers that faced Luke Harper and Erick Rowan on Tuesday night’s episode of SmackDown Live were Chris Wylde and Rory Gulak (the younger brother of Drew Gulak). **205 Live will be built around a 16-man single elimination tournament for the next two months for the vacant Cruiserweight title. The finals are set to take place at WrestleMania on April 8th in New Orleans. The tournament kicked off Tuesday with an outstanding main event between TJP and Tyler Bate with TJP winning the match after grabbing Bates’ trunks (Bate is the most under-utilized performer on the WWE’s roster and should be a top babyface on any of the brands). The other tournament match saw Cedric Alexander defeat Gran Metalik. Next week’s show will feature two more tournament matches with Roderick Strong vs. Hideo Itami and Lince Dorado vs. Kalisto from Kansas City, Missouri. **Damian Abraham of VICE spoke with Matt Riddle at the Smash Wrestling event in Toronto this past month about the art of chopping. **Ring of Honor has announced that Stardom performer Kagetsu has been added to the Women of Honor championship tournament. Kagetsu is one-half of the promotion’s Goddess of Stardom champions along with Hana Kimura. **Revolution Pro Wrestling has announced a rematch between Keith Lee and Tomohiro Ishii for Friday, May 11th at York Hall with the pre-sale for mailing list members beginning this Monday at 7 pm. The first match between the two can be seen on New Japan World. Because of the date, it would mean Ishii won’t be part of Ring of Honor’s War of the Worlds event in Toronto that same day. The War of the Worlds tour featuring talent from New Japan will take place from May 9th – 13th with four shows in Lowell, MA, Toronto, Royal Oak, MI, and Chicago. **A tag match with Seth Petruzelli and Simon Gotch vs. Jimmy Yuta and Jason Cade has been added to the MLW “Road to the World Championship” event next Thursday in Orlando at the Gilt Nightclub. **The WWE stock closed at $35.35 on Wednesday. **A lightweight fight between former champion Anthony Pettis and Michael Chiesa is set for UFC 223 on Saturday, April 7th at the Barclays Center in Brooklyn, New York. Brett Okamoto of ESPN was the first to report that fight was close to be finalized and MMA Fighting confirmed the bout on Wednesday. Following three consecutive losses at lightweight, Pettis cut down to featherweight for an ill-fated run and then return to the lightweight division last July where he defeated Jim Miller but is coming off a TKO loss to Dustin Poirier from this past November. Chiesa last fought in June of last year his three-fight win streak was ended a technical submission loss to Kevin Lee. The referee stopped the fight before Chiesa tapped and Chiesa was very upset at the call and believed he could have escaped the choke. **Dave Meltzer reports at MMA Fighting, that this past Saturday’s UFC event on FOX was the lowest number they have ever produced on the network, which goes back to November 2011. The card from Charlotte averaged 1,770,000 viewers with the peak viewership occurring during the main event between Ronaldo “Jacare” Souza and Derek Brunson with 2,224,000 viewers. The previous low for a FOX card took place in August 2016 for an event headlined by Anthony Pettis and Carlos Condit, which averaged 1,983,000, however that card pre-empted in 15 markets while this show aired nationally in all of the FOX markets. **Filming for the next season of “Ultimate Fighter” began on Wednesday with coaches Stipe Miocic and Daniel Cormier. Cain Velasquez, Javier Mendez, and Bob Cook are part of Cormier’s coaching staff. The two champions are scheduled to fight for the heavyweight championship at UFC 226 during International Fight Week on Saturday, July 7th.